She enters the fun house just as a thunder and lightning storm starts. She ventures deeper into the attraction into a room of many mirrors. After a few disorienting moments of seeing her reflection everywhere in the room she decides to head in the direction of the exit sign, only to crash into a mirror. Adelaide then turns around and sees the back of herself in another mirror. That’s almost impossible to do, even in a fun house. This is no reflection though, the reflection turns around revealing that it is another little girl that looks exactly like Adelaide. Thus the plot direction of the movie is set. The film then cuts to present-day where Adelaide (Lupita Nyong’o) is married and living the middle class family life with husband Gabe Wilson (Winston Duke), daughter Zora (Shahadi Wright Joseph), and son Jason (Evan Alex).They are all traveling together in a big SUV to a lakeside summer vacation home. After arriving they are invited to Santa Cruz to hang out beach side the next day with another couple, Kitty (Elisabeth Moss) and Josh Tyler (Tim Heidecker). As Adelaide and family travel to the beach, she starts getting a sense of dread, that bad things are going to happen. On the way, they see an unconscious man being loaded into an ambulance. It looks like it could be the man who had held up the Jeremiah 11:11 sign years earlier. A tossed Frisbee lands perfectly onto one of the large dot patterns on Adelaide’s beach blanket, covering it in a totally symmetrical way. This is another sign that things are getting a little weird. Later that night, safely back at their vacation home the son reports that there’s a family in the driveway. Gabe heads outside to the front stoop and calls out to them, “Can I Help You?” There’s no reply and the family in the driveway stands there motionless. Gabe then goes back into the house and they all come to the realization that the family is not a summer welcome wagon bringing over a tuna casserole. Adelaide calls the police who tell her that they will be there in 14 minutes. Gabe returns outside again, this time armed with a baseball bat, yelling like an angry old man, “Get off of my property.” the family still doesn’t move. Gabe warns them again and then moves towards them with the baseball bat and is rushed by the father with the rest of the family close behind. After getting the worst of the fight Gabe retreats to the house and slams the door. That’s the point that the horror plot starts to really accelerate and more details of what’s happening start to be revealed. The family that was in the driveway are doppelgängers of the Wilson family. They are the “Tethered” people who live below the earth in abandoned subway tunnels, mines, and other subterranean enclosures. 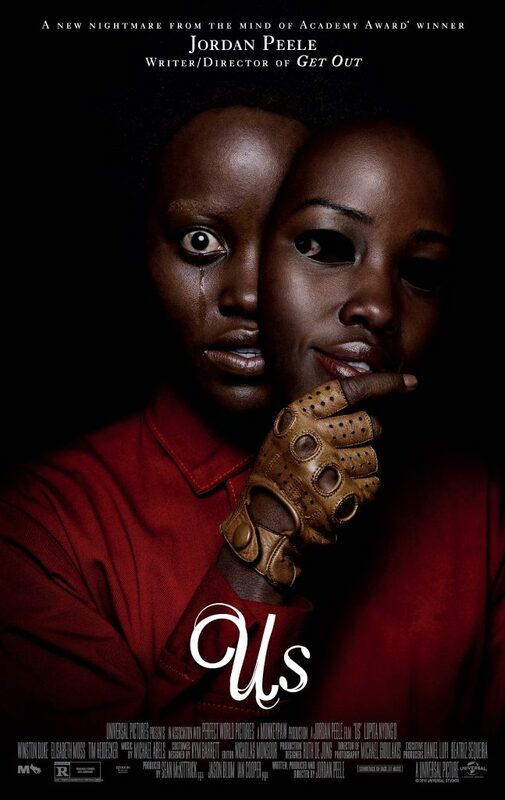 Lupita Nyong’o does a remarkable piece of acting both as family matriarch Adelaide and her Tethered counterpart, Red. Speaking in a very different voice, Red says that Tethered people were the result of a failed government experiment and they have been forced to live underground, eating only bloodied rabbit meat, and not getting to experience the joys of life that their Tethered counterparts above ground get to have. And that their lives are determined by choices made by their above ground counterparts. Tethered people all wear red jumpsuits and carry a large pair of scissors that they use to kill (cut) their relationship with their above ground counterparts. The Tethered people have not developed much in the way of vocal skills and are not naturally adept at socializing. One part is even evocative of George Romero’s Night of the Living Dead. The family has escaped to the Tyler’s house and they turn on the TV and are watching a special news report about how people in red jumpsuits and scissors are killing people across the land. Another surreal scene is near the end in the underground living quarters of the Tethered people. A long continuously moving shot down the main hallway shows people in the hallway and in the rooms doing various activities as rabbits run about. There are many Easter eggs (hidden clues and references) to look for after the film, you may even see some for yourself during the movie. It’s hard to get many of these real and imagined clues while watching. It’s almost more fun figuring things out after viewing the film than the actual watching of the film. Us, is a very entertaining film with a lot of action and some deeper meanings. The title of the film is Us, and that is who the Wilson family is most afraid of. They are us and we are them. Look at the news of the nation and the world, it’s not imaginary monsters or ghosts that are perpetrating evil, if is fellow humans. The film also demonstrates that a less regarded class of people can overcome obstacles and rise up with the right leadership and circumstances. The Tethered people have even mastered Hands Across America in their own special way. As a horror or science fiction movie, Us didn’t totally move the ball over the goal line for me, but it was very enjoyable. The ending is a real surprise and makes one contemplate once again the debate of nature versus nurture. Peele’s direction is smooth and all the actors performed their roles brilliantly. With the success of Peele’s first movie Get Out and his current box office blockbuster, Us, it will be fun to see what comes next.